On offer from us is a wide and eye-catching collection of Children Cushions. The products we offer are made using polyester fabric and filled with staple polyester fiber, which we source from authentic vendors of the market. 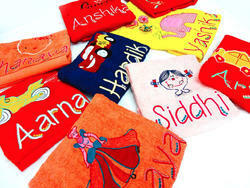 All our products are designed by a team of innovative experts in such a way that fascinate the kids. In order to uplift our reputation among the clients across the country, we are devoted towards offering Personalized Kids Cushion. These cushions are widely used in homes, hotels and many more places and used for decoration purposes. Offered cushions are designed from quality assured fabric as per the global set standards. A soft and simple flower shaped cushion with embroidered dragonlflies flying about give a complete look to any girl's bed. Size - approx 25 x 35 cm. Owing to the presence of our expert team members, we are able to offer a wide range of Kids Cartoon Cushion.